Many people enjoy the sweet taste of the tropical pineapple fruit, which can usually be found for sale at most grocery stores depending on the season. You can also create your very own pineapple plant at home. To make a pineapple fruit, you can either grow one from pineapple seeds or propagate one from the top of mature fruit, both of which are a simple yet slow-going process. What Is a Pineapple Plant? When many people think of pineapple, they think only of the yellow citrus fruit that's spiky on the outside and sweet and juicy on the inside. In fact, the pineapple that we know and love is actually named for the plant from which it comes: the pineapple plant, or Ananas comosus. These plants are native to warm, tropical areas like Central America and require ample sunlight and high temperatures to grow. Covered in thick, scaly skin and topped with a spiky crown, pineapple fruit also contains Ananas seeds, which can be used to produce even more fruit. 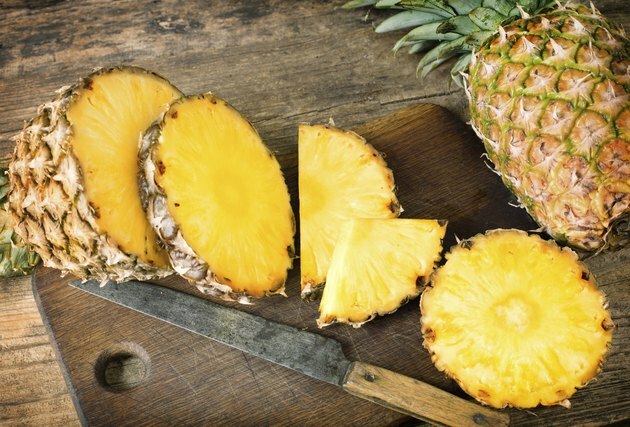 Pineapple fruit not only tastes great but has numerous health benefits. An antioxidant-rich citrus fruit, pineapple is rich in essential vitamins and minerals, including vitamin C, vitamin B-6, magnesium and potassium, among others. Pineapple has also been known to assist in reducing inflammation, improving digestive tract function and decreasing the risk of obesity and heart disease. To grow a pineapple fruit from seeds, you will need one ripe pineapple, a paper towel, a pot filled with potting soil, sunlight, warm weather and water. Finally, if you wish to grow pineapple you're going to need a hearty dose of patience, as these plants tend to take a very long time to grow and start producing fruit, sometimes up to two or three years. Before you begin growing your pineapple plant, you'll first need to find some pineapple seeds. These can be bought or more easily found inside a ripe pineapple fruit. Pineapple seeds are small black or brown flecks almost resembling flaxseeds. If you're removing your pineapple seeds from pineapple fruit, it is recommended that you try rinsing them in water to remove any sticky residue. Then you can germinate the seeds by bundling them in a wet paper towel, which will cause them to sprout. Since this process can take around six months, you can store them in a plastic bag or an airtight container. When the seeds have sprouted, you have new baby pineapple plants on your hands that are ready to grow. To begin the growth process, simply place the plants in a pot filled with soil and keep that pot in a warm room, no less than 50 degrees Fahrenheit. Be sure to give your plant plenty of sunlight and water. Just be careful not to let your young pineapple sit in stagnant water. If starting from pineapple seeds isn't an option for you, you can also grow a new pineapple plant from an existing pineapple fruit through the process of propagation. To propagate a pineapple plant, start by cutting the fruit just below the spiky top. Once you have your top, remove a few of the leaves at the base of the cutting and cut away the outer skin of the fruit before allowing the stump to dry out for a few days. Once your cutting has dried, you can place it directly into soil where it will begin to root. The rooting process should take around two months, during which time you'll want to make sure your plant is getting everything it needs to grow: sunlight, warm temperatures and water in well-draining soil. Some plants will take years to produce fruit if it does at all, but the plant will still offer long, hearty, spiky leaves that can make a great addition to any garden or outdoor space.